The most buoyant of the lighting family, pendant lamps are awfully fun but take a bit of planning; here's how to do it right. One way to hang a pendant? Colorblocking. 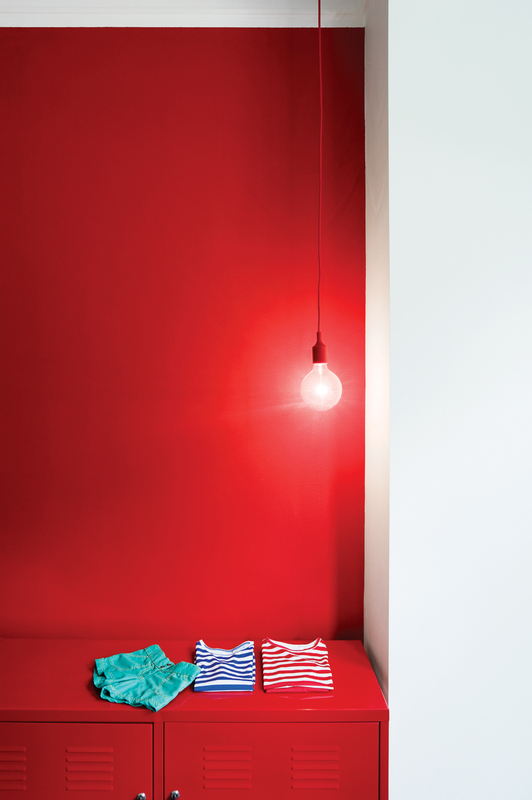 A nook painted in crimson lit by a Muuto pendant with a matching red cord adds just the right punch to an otherwise monochromatic house, like this one in Hamburg. Read the whole story here. A mirrored finish pops against a wood background, like in this 1960s Long Island bungalow. Architect Page Goolrick left the oiled wood interior cladding as-is and set off the kitchen area with a Mirror Ball pendant by Tom Dixon. Read the whole story here. Another good example is the kitchen of a Hollywood bachelor pad designed by Noah Walker of Walker Workshop Design Build. The Globo di Luce pendants in the kitchen are by Roberto Menghi for Fontana Arte. Read the whole story here. Originally appeared in You Won't Be Calling This House a "Man Cave"
The flip side of that equation is adding warmth to a white room with a wooden shade, like the oversized birch-veneer pendant lamp hung in the master bedroom of Brad Zizmor's Upper West Side co-op. Read the whole story here. Paper lantern-style pendants are ubiquitous for a reason: They're affordable, look good in multiples, and are a simple design solution for an otherwise detailed room. The light paper shades contrast the timber and adobe mud blocks used in this home by and for Ghanian architect Joe Osae-Addo. Read the whole story here. Another popular pendant option is the Unfold lamp by Form Us With Love for Muuto, with a flexible silicone shade that comes in seven colors, including a vibrant blue (seen here) and searing yellow. Neutral flooring, a dark wall, and the rubber lamp help keep a sense of play without tipping into formless clutter in this Bratislava apartment by Gut Gut . Read the whole story here. Contemporary steel helps update a traditional setting like the living room of this Victorian in Louisville, Kentucky. Vintage Bertoia chairs, a Gloss floor lamp by Pablo Pardo, and a Norm 03 Steel Pendant Lamp by Normann Copenhagen bring the look up to modern standards. Read the whole story here. And let's not forget the scuptural influence of the Artichoke pendant by Poul Henningsen for Louis Poulsen. In the dining area of the EggO House in Prague, the silhouette is referenced by a similar pendant light from Ikea. Read the whole story here. Pendant lamps occupy a cozy position in the lighting family: They take more installation know-how than a plug-and-play table or floor lamp, though less effort than the hard-wiring required for their sconce cousins. Pendants are, visually- and literally-speaking, lighter than chandeliers, and great for filling soaring spaces or freeing up surface area in a smaller nook. Check out the tons of great pendant lamps in Dwell's products archive, and read on here for tips on how to maximize their effect in a room.